Beijing-based Xiaomi touts its Mi 8 Pro Explorer smartphone as “a phone unlike the rest, beneath the transparent glass back, the phone’s intricacies are on full display as technology and artistic beauty merge.” However, what is seen through the transparent back is a fake PC board ― with no real working parts because almost all are made from plastic, announced the Teardowns service of ABI Research, a market-foresight advisory firm providing strategic guidance on the most compelling transformative technologies. “The PC board that is visible through the transparent part of the back of the Mi 8 Pro Explorer is fake. While most people now know that it is not a real PC board, many still assume the transistors and chips they can see are real. “Most are not,” said Kyle Warren, Teardown Analyst at ABI Research’s Teardown service. “The visible components are mostly plastic mockups (the nine larger components including the Qualcomm Snapdragon) and non-functional component imposters. There are 101 capacitors, 32 resistors, 11 hall effect switches, 6 Skyworks digital capacitors, and 7 LNAs that are legitimate, but they are all non-functional in the phone,” Warren confirmed. For a phone to work effectively, the entire PC board needs to be covered by an RF shield ― an electromagnetic shielding that blocks radio frequency radiation. The teardown revealed that a full, working PC board (that includes the real Qualcomm SDM845) is under an RF shield, which is underneath the faux PC board. “There is nothing pretty about a real PC board, so it makes sense that Xiaomi wanted to make the Mi 8 Explorer’s transparent back more visually appealing and a point of difference,” added Warren. 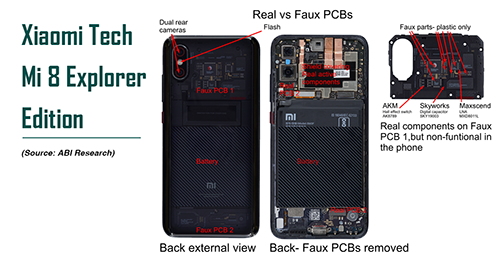 For ABI Research’s Teardown results on the Xiaomi Mi 8 Pro Explorer smartphone visit https://teardowns.abiresearch.com/teardowns/xiaomi-mi-8-explorer-edition-teardown/#features. These findings are from ABI Research’s Teardowns (https://teardowniq.com/), which include high-resolution photos and x-rays, pinpoint power measurements, detailed parts lists and block diagrams.